This is a simplified version of baccarat, a variation that was created by stripping the game of baccarat to its basics literally, without any hassles and intricate rules. The rules under which is played mainly follow the rules of American Baccarat, only that here the atmosphere is much more relaxed and the betting limits are much lower. It’s a more casual game without the need for any official ceremonies. The table is smaller than that used in standard baccarat and can accommodate seven players at max… something like the size of a blackjack table. An average Mini Baccarat game returns 99% of the wagers to the players, which is a feature that the majority of casino games lack. 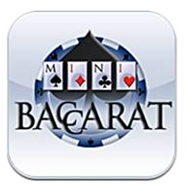 In general Mini Baccarat is very similar to regular baccarat. They share the same goal, the cards have the same values, and the rules are practically the same too, only that here the basic rules are used, without the banking etc. Six to eight decks are used, and three bets are allowed: a player, a banker and a tie bet. The payout for the player and banker bets is even money, and the tie pays 8 to 1. Almost everything is the same as regular baccarat, but as we mentioned, the gameplay is much more relaxed. Mini Baccarat was devised more for occasional players. There are no procedures of becoming the banker, dealing the cards, and other ceremonies included in other variations. All of that is done by the dealer, and you don’t even touch the cards when playing in a land-based casino. You just play against the house represented by the dealer and everything is straightforward. The game brings a very casual atmosphere, for example, the dealer is not dressed in a tuxedo, and there is no dress code. Most of all, the betting limits are lower, which is exactly what a casual player wants, and the rules are not complicated at all. There are no special strategies in playing Mini Baccarat. Anything that you can use as a strategy in regular baccarat, you can use here too. Baccarat in general is a game where you have to use your luck, and not your skills. Take advantage of the lower bet limits by sticking to them. That way you can play more hands with your bankroll, instead of spending it in 15 minutes, instead of playing longer. But, as you grow better you can go for the bigger bets and ultimately switch to other more complicated baccarat variations. Bet on the banker hand because it has a house edge of 1.01%. By betting on the tie bet you accept to play with a 15.75% house edge, so avoid it. The Mini Baccarat table is smaller, which means fewer players are in play and thus more hands are played in an hour compared to regular baccarat, so don’t play every hand in that hour in order not to burn your bankroll too quickly. WHERE CAN I PLAY MINI BACCARAT ONLINE? There are two software providers, the two biggest ones, which offer Mini Baccarat and both have a superior design compared to their competition. Below you can read about both games, and we have picked one online casinos powered by Playtech where you can play Mini Baccarat. Playtech’s Mini Baccarat is mainly offered as a live dealer game. A Playtech powered casino that offers live Mini Baccarat is Ladbrokes Casino. They maintain 4 different live Mini Baccarat tables at the same time, and each offers a minimum bet of €1, while the maximum is €30. The casino offers a 100% up to €500 to all new players, and gives €50 free cash for playing the live dealer section. This game from Microgaming features a banker hand house edge that is lower than 1.01%, so you would probably want to try this game as well. That is because Microgaming’s Mini Baccarat uses less than 6 decks of cards. If it did 6 to 8 decks, the edge would increase to almost 1.06%. Maybe this may seem as a small difference, but it can save you a dollar or two. The commission taken on the banker hand is standard 5%, but it can depend on the casino. The payouts are the same, and the minimum bet varies from $1 to $5.